Osteoporosis is the medical condition when the bones become deficient of the essential minerals like calcium, magnesium, etc. This results in lowering the bone density and loss in the structure of the bones. Irrespective of gender, this complication may affect any individual. This complication increases the various spaces in between the bones. The rate of loss of bones increases at a rapid pace. Chronic complications like Cushing's syndrome, rheumatoid arthritis, etc. The natural remedies include certain dietary measures, home remedies, herbs and herbal treatments. 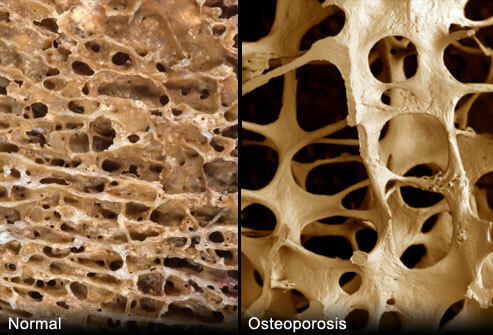 The home remedies to be followed for treating osteoporosis are the following. Intake of food items rich in calcium and vitamin D are highly recommended to the individuals suffering from osteoporosis. Bananas, sprouts, apple and consumption of certain herbal teas are extremely helpful for the individuals facing osteoporosis. Besides, patients should follow certain tips very seriously. Certain tips help to lead a happy, healthy and fit life. Practice exercise on a regular basis. Massaging with oil to ensure proper circulation of blood and other body fluids in the body efficiently. Reducing smoking and consumption of alcohol to a huge extent. 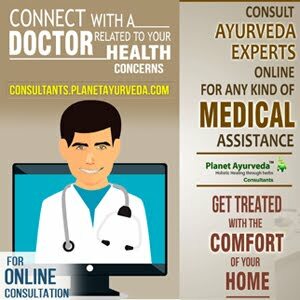 Besides these, there are a number of herbal remedies provided by Planet Ayurveda. This helps to get relief from the pain and inflammation significantly. Planet Ayurveda has provided some of the wonderful herbal remedies for the treatment of the complications related to the bone density, known as osteoporosis. 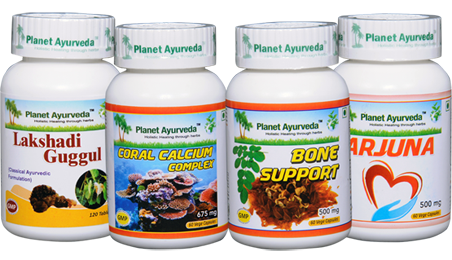 The 'Osteoporosis Care Pack' provided by Planet Ayurveda is extremely helpful in providing solutions to the pain and inflammation. This package has the following components. These components are very safe to consume and are completely vegetarian and natural. They do not have any side effect at all. They are extremely effective. These capsules are made of natural calcium compounds and herbs. These are purified laksha, suhanjana beej, hadjod, praval pishti and mukta. This supplement helps in improving the metabolism of calcium in the individuals. Dose: 2 capsules two times on a daily basis. These capsules are made of trace minerals and the following compounds. Dose: 1 capsule two times on a daily basis. This herbal supplement is made of Commiphora mukul, Cissus quadrangularis, Terminalia arjuna, Grewia hirusita and Withania somnifera. It helps in enhancing the deposition and absorption of calcium in the body. Dose: 2 tablets two times on a daily basis. These capsules are made from the extracts of the herb, Terminalia arjuna. It contains several chemicals like flavonoids and antioxidants. These are extremely helpful in treating the various signs and symptoms of osteoporosis effectively. WHERE TO BUY OSTEOPOROSIS CARE PACK?